One of Grace’s latest writing projects draws inspiration from her life experiences and her role as a Hospital Chaplain. 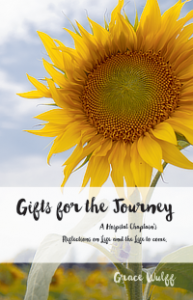 Gifts for the Journey is a booklet and it contains ten simple stories, in ‘Chicken Soup for the Soul’ style, that will inspire and encourage. The idea for this booklet came from the premise that we give out a lot of clinical information at hospitals, and there is also a need to provide inspirational material to encourage and bring hope in the midst of difficult life challenges. This booklet can be used in a variety of settings, or just enclosed in a card and given to a friend who needs encouragement.